Reliance Infrastructure, the oldest among the ADAG companies, with the legacy of Bombay Suburban Electric Supply, is trying to build itself a new future in difficult times. The old electricity House at Santa Cruz (East) has been demolished, and the concrete foundation for a new building put in place. Another building— on the same plot—will be demolished once the new six-storey building is ready. On a few tamarind trees within the compound, hundreds of white egrets perch, watching the sky darken, oblivious to the aircraft taking off from the airport across the Western Express Highway. The evening at Reliance Infrastructure’s headquarters in Mumbai is analogical of the company—building itself a new future in infrastructure in an economic environment that is gloomy. 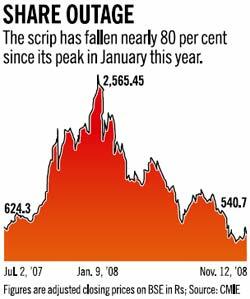 The Reliance Infrastructure scrip has fallen almost 80 per cent in the last 11 months. Reliance Power, in which the company holds 45 per cent, has done slightly better, dropping only 60 per cent since listing (after considering the bonus shares issued). But in the last week of October, at least four analysts put out buy recommendations on the stock. Bharat Parekh of DSP Merrill Lynch (India) said the price objective is Rs 1,500-Rs 1,210. Morgan Stanley’s Parag Gupta and Saumya Srivastav put a price target of Rs 1,779. Indiabulls and Motilal Oswal, too, put out buys on the stock. The stock was moving between Rs 381 and Rs 540 during the three weeks since those reports were released; in January, it had crossed Rs 2,600 in intra-day trading. The company, then known as Reliance Energy, launched an open offer on March 25, 2008, and has bought back 73 lakh shares.
. Five road projects: Two road projects are 75 per cent complete and are likely to be commissioned in January 2009, while construction has begun on the balance. They are likely to be commissioned by July 2010.
. Mumbai metro: Financial closure has been achieved. The likely commissioning is September 2010.
. Delhi metro: Major contracts (Rolling Stock, Signaling, Traction and Power Supply) awarded, likely to be commissioned by July 2010.
. Hyderabad real estate (CBD): Construction is expected to begin in the next financial year.
. Dakc SEZ EPC: Contractors are likely to be finalised soon. The company expects to start construction in the next financial year and complete the first phase in the next two years. Source: Company data, Morgan Stanley Research *50% progress achieved; #80% villages have been handed over. The company sees a growth of at least 50-60 per cent in the EPC or Engineering, Procurement and Construction business. From being a pure power sector player, Reliance Infrastructure has also entered areas like building of Special Economic Zones (SEZs), metro rail systems, roads and bridges, and real estate—eyeing overall annual growth of 20 per cent. Subhashchand Gupta, Director of Operations, says a tie-up with China’s MCC is in place to allow Reliance to start building steel plants. He dismisses fears about the quality of China’s power equipment even as he invites them into steel. There are more faces of the transformation. For one, the power generation business is being separated. J.P. Chalasani, who was a Director of Reliance Infrastructure, moved to Reliance Power to head it. Jalan was at the helm of the distribution business before making a slow and almost unnoticed transition into his current post. The company now retains its old power plants and is entering a host of new businesses (see Infrastructure and EPC). Gupta still supervises the power projects of Reliance Power that are being built, even though Reliance Infrastructure is not building all of them. Similarly, Senior Executive Vice-President for Finance and Accounts, Madhukar Moolwaney, oversees the finance function at Reliance Power, even though a separate project finance team has been set up at the group level for all the companies. Jalan has ambitious plans for distribution. A company team is making presentations to state governments across the country. “Because of the work done by private players in Delhi, power is no longer an election issue this year. Inverter sales have fallen by 80 per cent,” he says. “One new state can add 33 per cent to our distribution revenues and give us 6 million new consumers. Otherwise, we grow at 6-8 per cent per year,” he says. The company is now even offering to come on board as a consultant for state electricity boards. The new story is EPC, in which Reliance has an order book worth over Rs 20,000 crore. Gupta, who had worked for the unified Reliance group setting up captive power plants at Patalganga and Hazira, is today a fan of Chinese power equipment. The company is building the Sasan Ultra Mega Power Project for Reliance Power, among others. It has already built the Yamunanagar and Hissar plants in Haryana for the state government, using Chinese equipment. With Reliance Power planning to double capacity at Sasan and Krishnapattanam, there is enough for the EPC group to do in-house for many more years. The Chinese equipment tie-up with Shanghai Electric has helped the group get equipment that is cheaper than local brands, and get it without waiting. With Reliance Infrastructure already having earned a name for itself because of its work on the Yamunanagar and Hissar projects in Haryana, Gupta is now keen on building steel plants and even nuclear power plants. Gupta is also on a hiring binge—the number of engineers on its rolls is likely to double from 2,000 to 4,000 in a year. The infrastructure business includes roads, bridges and metro rail. It is building the Versova-Ghatkopar line in Mumbai and the airport link in Delhi. It has bagged the Amritsar metro on a Swiss challenge basis where the company develops the project and then participates in the bidding process too. Where the company is going a little slow is in its real estate projects like the one in Hyderabad. Jalan says bankers’ appetite for funding realty is low right now and the company will bide its time. It is building an SEZ for IT in Navi Mumbai over 45 acres but isn’t looking at anything much bigger. “We cannot wait for 10 years to acquire land,” he says. Here, Reliance Infrastructure is comfortable: it has Rs 10,500 crore of cash and a total debt of Rs 4,500 crore on its balance sheet, giving it a lot of net liquid cash. Says Moolwaney: “Banks are happy to deal with companies like us who can put up equity upfront quickly. In all the projects that we have in hand, we have a equity requirement of Rs 3,500-4,000 crore in the next four-to-five years”. Moolwaney points out that the company might be able to meet its needs from the cash it generates every year. “In 2007-08, our cash flow was around Rs 1,300 crore,” he says. He says current debt is at around 8-8.5 per cent after including the cost of hedging. This is at least 2-3 percentage points lower than the cost of loans being contracted today. Associate Reliance Power is even richer with almost Rs 10,000 crore of net cash raised through the initial public offer in January. Satyam Agarwal, analyst for Motilal Oswal, says there are no questions about the ability of the management. “The worry comes out of the economic scenario. The group needs to raise Rs 90,000 crore through debt at a time when the banks are not so upbeat about the sector,” says Agarwal, who has a target price of Rs 800 for the stock. “It is good to have the cash, but the company will have to convert it to project equity,” says Agarwal. Agarwal also says that a Rs 100 price increase in the shares of Reliance Power will add Rs 360 to the price of Reliance Infrastructure stock. What will keep Reliance Infrastructure in good health through the difficult period ahead will be the generous cash flow that comes from millions of retail customers.